On the east bank of the River Tyne at Chollerford stand the remains of a Roman bridge. The west end of the bridge led to Chesters Roman Fort, and the bridge carried the line of Hadrian's Wall across the river to the fort. 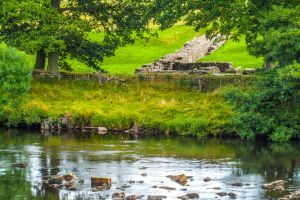 The remains are visible on both sides of the river and can be seen from a special viewing platform beside the bathhouse at Chesters. The bridge was built in two phases. The first phase was under Emperor Hadrian, at the same time as the Wall was built (AD 122 to AD 124). This first bridge was supported by 8 stone piers set about 4 metres apart. The easternmost of the piers was incorporated into the later bridge abutment and can still be seen. The bridge stretched 61 metres across the Tyne and was wide enough to carry the Broad Wall (the first design for Hadrian's Wall, measuring 3 metres wide). In about AD 192 (some sources suggest an early 3rd-century date) Hadrian's bridge was replaced by a larger, stronger bridge with 4 arches supported on 3 very large and solid piers. Associated with this phase were a water mill and towers. The huge rectangular stones used for the abutment were bound together with large iron ties. This second bridge was 57.6 metres long, with the piers set 10.4 metres apart. Remains of both phases of the bridge building can be seen today. During excavations in 1978 an altar to Disciplina was found, with an inscription suggesting that the first military presence at Chesters delegated to guard the bridge was a cavalry wing. Two piers can be seen where they have fallen in the river bed. The third is half-buried in the east bank of the river. The River Tyne has shifted some 20 metres since the bridge was built. This gradual change has destroyed most of the western abutment but has left the eastern end of the bridge on relatively dry land. I say 'relatively' because the last time we tried to visit, floods had swept away a section of the footpath, making it dangerous to approach the bridge. As I write this the footpath is being restored so that access will soon be opened again. There is a footpath to the bridge from the south end of the road bridge at Chollerford, but if you don't fancy the walk you can get a reasonably good view of the bridge remains from the viewing platform at Chesters Roman Fort (English Heritage).